It's with great sadness I dedicate this issue to Jason Seifer, a popular member of the Ruby community who died last weekend. You may have known him as a Ruby trainer, as DJ Ango, from his famed 2007 'Rails vs' videos, or from the many podcasts he did. He'll be missed. A major milestone for an increasingly popular framework. Opinionated like Rails, it takes a more minimal approach in enforcing modularity, avoiding monkey-patching, and the use of POROs. An in-depth look at the vulnerabilities thrown up by session secrets and how easy bad session secrets are to crack. Sinatra and Rack are used to illustrate the concepts involved. Noah continues his series on Rails benchmarking, this time increasing the number of processes. Turns out, more than one makes a lot of sense for big performance gains. 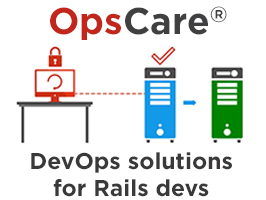 Our out-source DevOps solves the problems associated with ROR development. Plus our blue/green pre-baked, deployment process means that you can deploy your app as often as you want. Get started today – start enjoying OpsCare®. Generates models, controllers, and views for your app that inherit from its core classes, making it easy to customize and integrate. 10 years ago Jason Seifer and Gregg Pollack filmed a series of humorous Apple-inspired ‘Rails vs’ videos. We will miss you, Jason. No more security or bug fixes will be ported back. Upgrade to 2.3 or 2.4. Using simple delegators with ActiveModel can result in some surprising behavior. A nice approach when imported data doesn’t comply with rules in the target app. The second article of a series showing the difference between Rails and Hanami. Caching work done by methods can be a big performance win. Previously you had to give it a ‘basename’ to use. 60+ blog posts on the lesser-known bits of Ruby. We’ve linked to it a lot in the past couple of years. Learn to Dockerize/test Ruby apps, and look at Docker's features from the perspective of a Dockerized Rails app. Analyzes GraphQL queries against ActiveRecord models to optimize queries of associated data. An interesting project built on top of Utopia (a Rack-based web framework) and Relaxo (a git-based persistence framework).